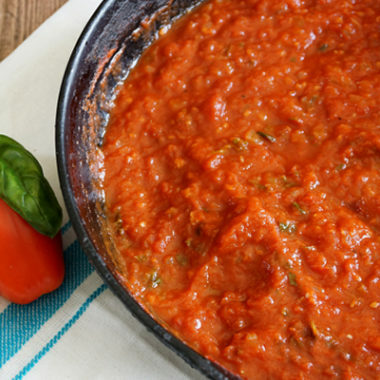 Making this Simple Pizza Sauce Recipe is such a sinch! You could say I’m pretty picky about my pizza sauce…I want to know what’s in it and I don’t want to spend a ton of money on it. So, I’ve been making my own for years! And it’s really delicious, tastes so much better than the jarred stuff from the store. 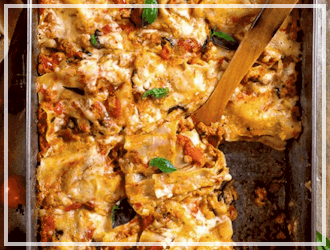 If your family loves pizza as much as mine, you will want to double or even triple the recipe. 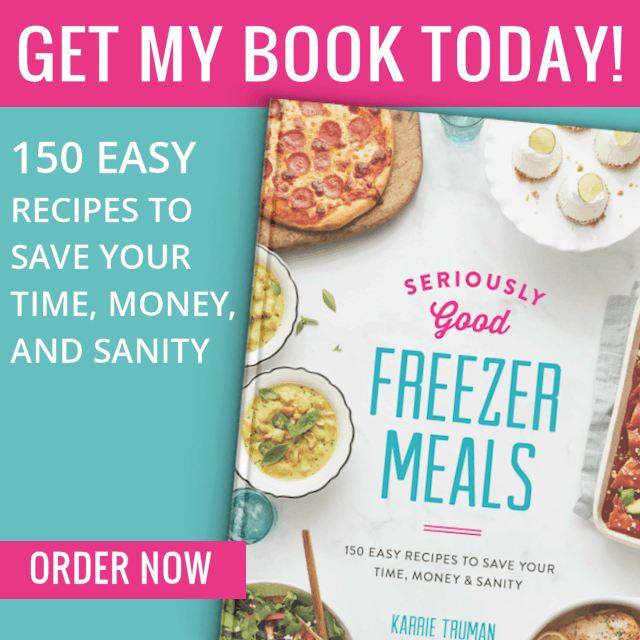 You can use it right away, store it in the fridge for up to a week, or in the freezer for up to 3 months! 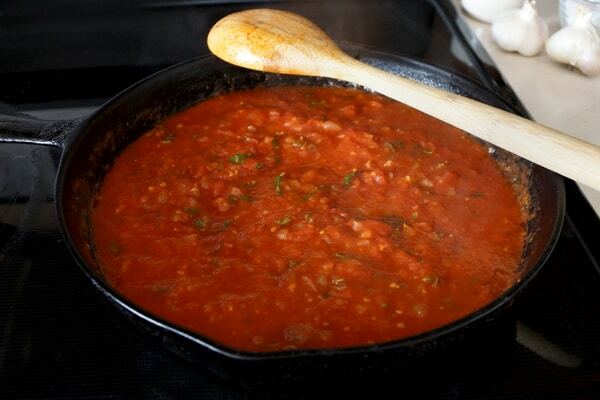 But, once you smell it simmering on the stove…I have a feeling you will be craving pizza by the time it’s ready! I love using fresh ingredients! 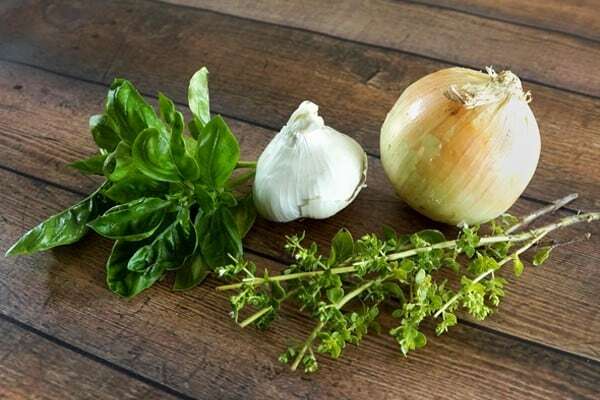 Fresh herbs and garlic will really add a lot of flavor to your sauce, but if you only have dried herbs on hand, they will work fine, too. 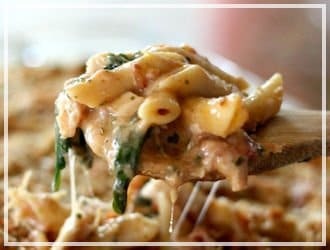 You could even use fresh tomatoes in this recipe…but, I would only recommend it if they are in season. 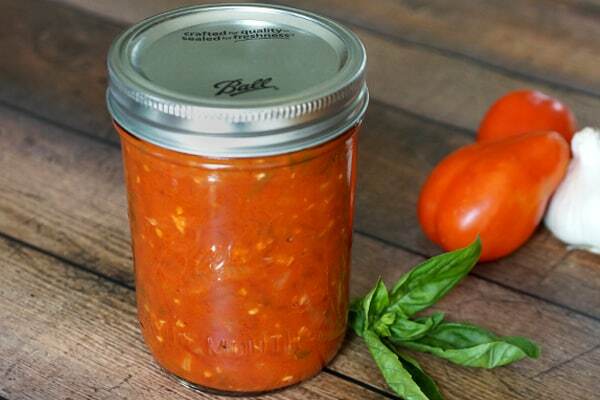 Good quality canned tomatoes are available year round, and that’s what I’ll be using today. First, let’s prep the tomatoes. 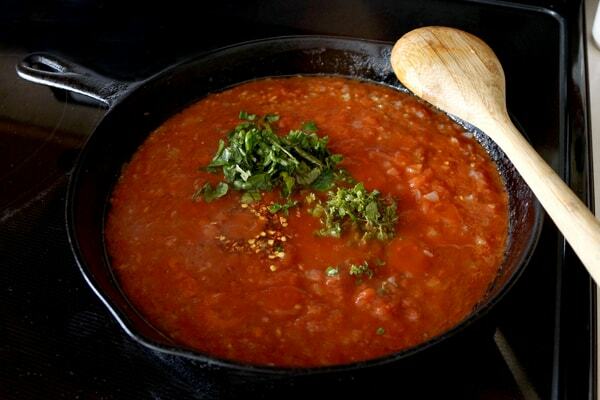 Empty the tomatoes into a large bowl and crush them into small pieces. I find using your hands works best…it’s a little messy, but totally worth it! This sauce will be just slightly chunky, so you don’t have to break them down completely. I like a little substance to my sauce, but if you want your sauce a little smoother, a few pulses of an immersion blender at the end would do the trick! Next, preheat a large skillet on the stove to medium heat. 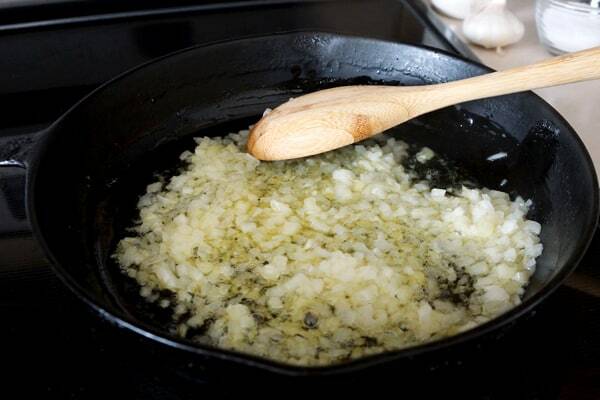 Add your olive oil and butter to the skillet. Once the butter has melted, add the onions. Cook them for 3-5 minutes, or until the onions are translucent, but not browned. Add the garlic and cook until it becomes fragrant, only about 30 seconds. Then, add the tomatoes, basil, oregano, sugar, salt and pepper. 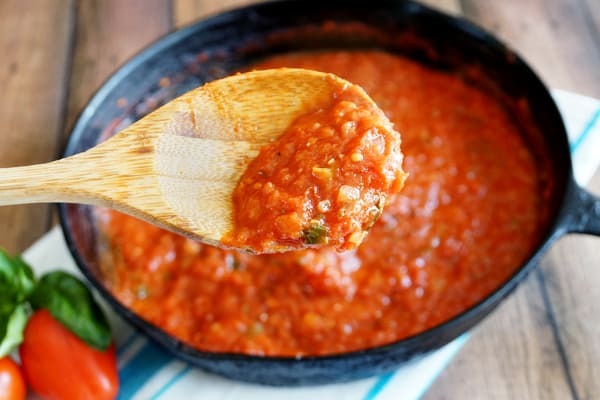 I also add some red pepper flakes to my sauce…I love the little bit of heat it brings. We like things spicy over here, so I add about 1/2 teaspoon. You can leave this out completely or even add a little more if you really want to feel the heat! Simmer on low for about 30 minutes, stirring occasionally. 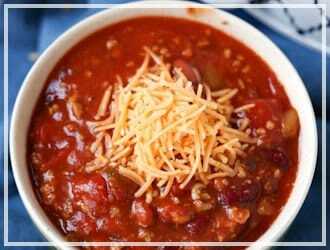 Simmering is a really important step, it’s where all the flavors merry together and get super yummy. That’s it…you’re done! So easy! 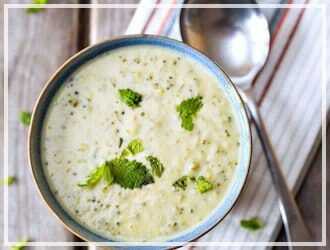 It’s ready to use right away or you can let it cool to room temperature and it will keep in the fridge for up to a week. Look at all those little bits of deliciousness! When I store it in the fridge, these Ball Jars work great! 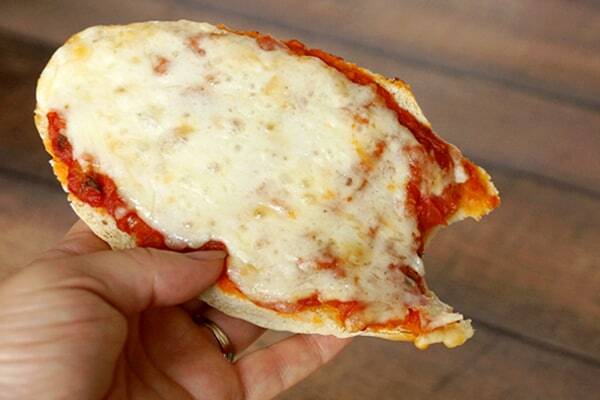 We love to make homemade pizza bread using my Homemade Bread Buns Recipe. I just make a batch of hoagie buns using this recipe and cut them lengthwise, add sauce and cheese (and any other toppings we want that day) and bake at 350˚ for about 10-15 minutes. They are a lunch time life saver! You’ve got to try it…you won’t be sorry! Sorry, I couldn’t wait any longer! YUM! Cool the sauce to room temperature and put in freezer safe zip lock bags (it’s best to portion enough for 1 pizza). 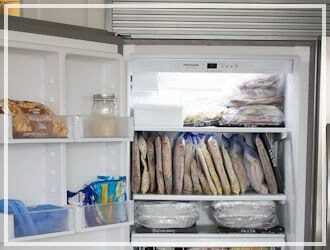 Lay flat in the freezer to save space. It will keep up to 3 months! 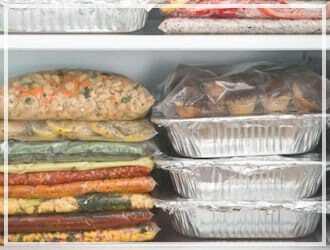 To thaw, place in the refrigerator over night. 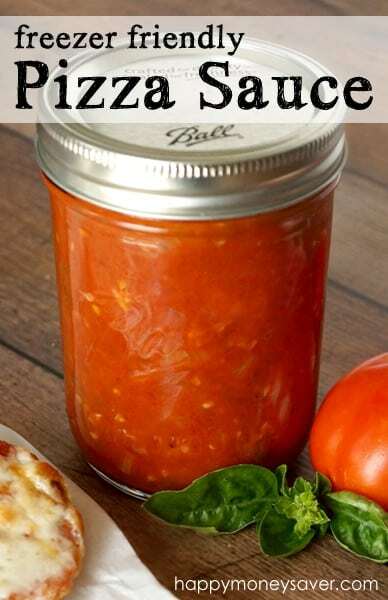 Simple Pizza Sauce is really delicious, tastes so much better than the jarred stuff from the store! 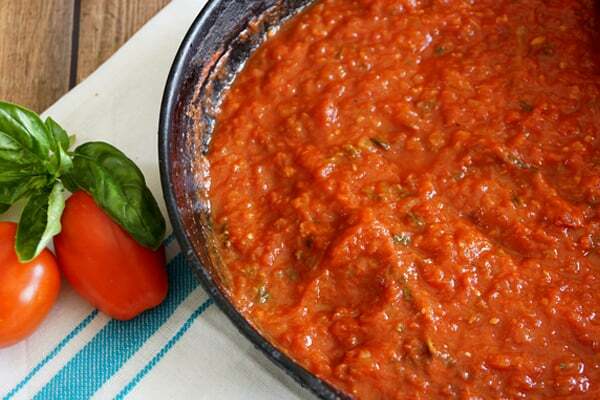 Pour tomatoes in large bowl and crush into small pieces with hands. Preheat large skillet to medium heat, add olive oil and butter. Add onions and cook 3-5 minutes until translucent. Add tomatoes, basil, oregano, red pepper flakes, sugar, salt and pepper. 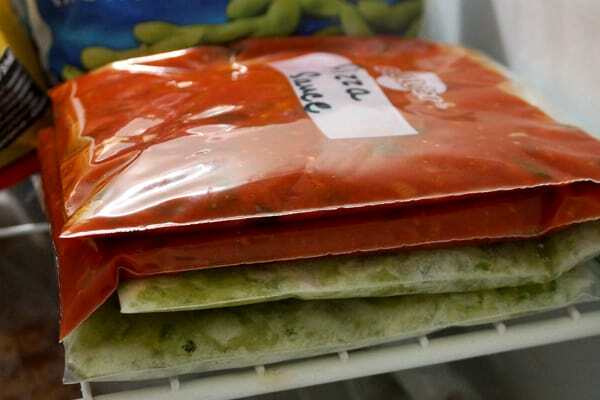 Freezer Instructions: Let sauce cool to room temperature. 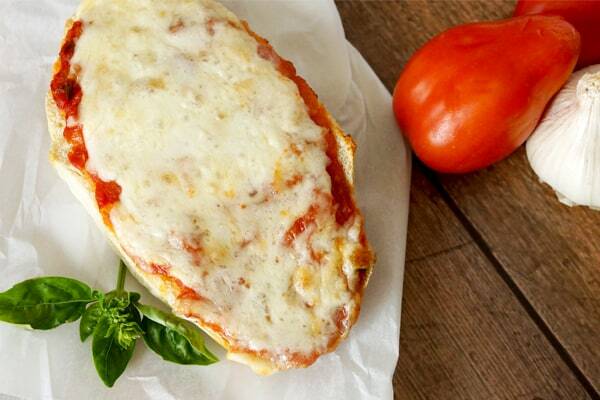 Pour into zip lock freezer bags (portion sauce enough for 1 pizza in each bag). Label and lay flat in freezer. To thaw, place in fridge over night. The calorie count seems way off. 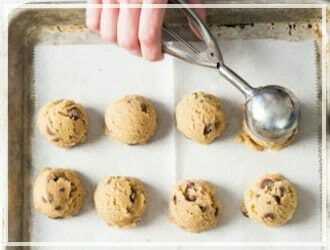 Is it correct, per serving? Could I use fresh tomatoes for this? Thanks for sharing it looks amazing. Can you can this sauce as well? I really don’t have a lot of room in my freezer but I do can a lot of things. I was just going to ask this. 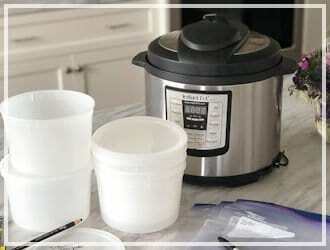 Thinking pint jars, water bath 25minutes?